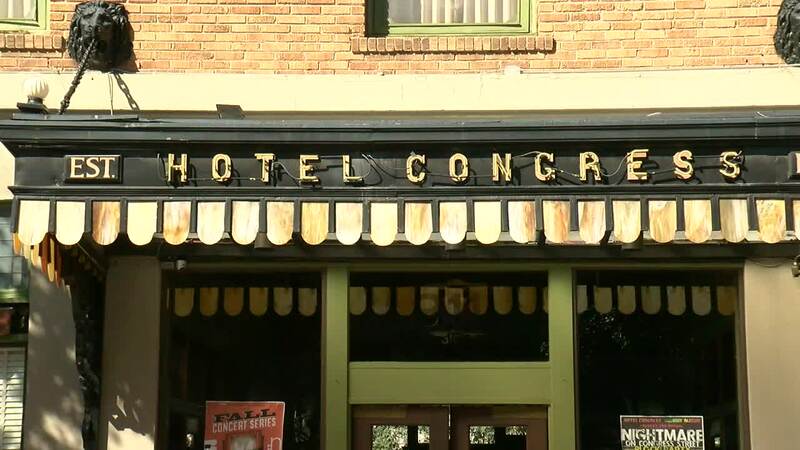 The iconic Hotel Congress in downtown Tucson will soon begin a year-long centennial celebration. Richard and Shana Oseran have owned the hotel since 1985 and will oversee the 100th-anniversary events. "We see this as the cultural hub of the community and an asset that belongs to everybody," said Richard Oseran. "There are no locks on these doors. Never has been. We're the stewards and our family is the stewards. This is just part of Tucson." Almost from the beginning, there has been confusion about the hotel's name. On the marquee over one entrance, it says Hotel Congress. Over the other entrance, it says Congress Hotel. "It was referred to both ways," explained Richard. "I think initially a lot of people called it the Congress Hotel. Back in the teens. Later, it sort of changed. Some of the stationary referred to it as Hotel Congress, where summer spends the winter 1919." In the Hotel Congress lobby, you will still find the original 100-year-old floors, the original safe, and the old phone booths. Guests still use rotary dial phones in their rooms to call down to the front desk, where it's answered on the original switchboard. But the most striking feature of the lobby is the wonderful "Southwest Deco" style murals painted by Larry Boyce nearly 20 years ago. "Everyone has their favorite," said Shana Oseran. "On the top there is an owl. Other people love the suns and the different lighting at different times." Just off the lobby is Tiger's Tap Room where you'll always find Tiger. He has been serving Hotel Congress patrons since 1959. Next to Tiger's is the famous Club Congress. Started by the Oseran's shortly after they took over in the mid-80's, they take pride in supporting live music in Tucson. On the second floor, you will find the guest rooms. "The third floor also had hotel rooms, but it was lost in the fire," explained Richard. He is referring to the fire in early 1934. As guests escaped the flames, Tucson Firefighters identified two members of John Dillinger's gang. That led to the eventual arrest of Dillinger. Hotel Congress still commemorates that event every January with Dillinger Days . Some believe the hotel is haunted., not by Dillinger, but by at least three spirits who died in the hotel. Reader's Digest lists it as one of the "24 most haunted hotels in America." They do have a Ouija board, not from some of the second-floor rooms said to be haunted. "I never know what to say? Yes it is or no it isn't. There is definitely activity," said Shana. "We've had Navy Seals running out of the hotel in the middle of the night," added Richard. Tucsonans can take a tour of Hotel Congress during an open house on Nov. 18. It will serve as the kickoff to the year of events commemorating the centennial . You can see for yourself why Hotel Congress is Absolutely Arizona.